Knowledgeability – We’re solely dedicated to providing Microsoft solutions. From quote to deployment, our highly-skilled team of Microsoft experts answer the questions other providers can’t. It’s important we offer peace of mind with our expertise and ensure that when customers buy a customized Microsoft solution from DataON, they will get the support they need to have a successful deployment. Certifications – In addition to all of our solutions being certified for Windows Server 2016 and 2012 R2, they are also validated by Microsoft to earn the highest certification, Windows Server Software-Defined (WSSD) hyper-converged infrastructure premium. WSSD solutions provide the highest level of performance, manageability and security offered, delivered as a fully-deployed experience. 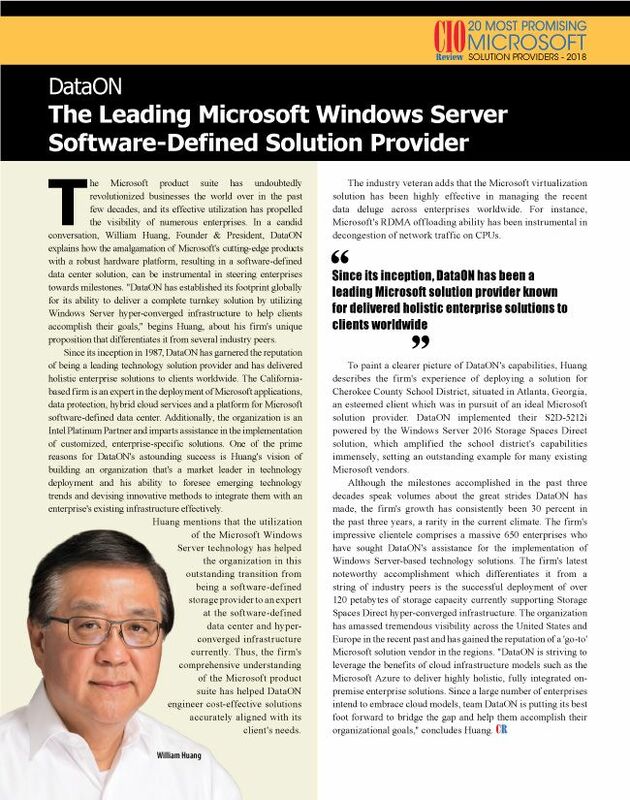 Most of our solutions are also Intel Select Solutions for Windows Server Software-Defined Storage. These solutions are designed and benchmarked to perform optimally for Windows Server SDS. Support – Many other vendors sell a product. Once the transaction is complete, their customers are on their own. At DataON, we know that sometimes deployments don’t always go as planned. We’re there for our customers every step of the way and provide our customers detailed deployment guides and scripts, and the technical support they need to get up and running and stay up and running. As we continue to grow and expand our solution offerings, DataON is committed to providing the best Microsoft solutions and customer experience in the industry. We thank CIO Review for recognizing our hard work and dedication to our customers!